The Eduk8 project aims at empowering ESN volunteers and investing in the development of their skills and competences through non-formal education (NFE) methods. 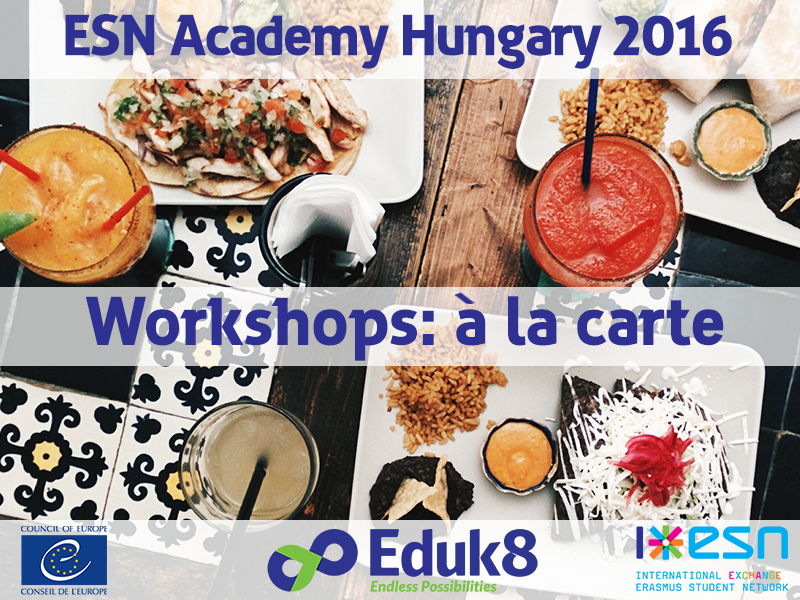 The ESN Academy is a 4 day event that will engage 100 ESNers and introduce them to a learning experience made of workshops based on non-formal education methods. The workshops will be delivered by ESNers from the different Pools of Eduk8 and there will be a wide range of workshops focused on soft skills development (such as teamwork, motivation, communication, etc). The main topic for this year's ESN Academy is: "Peacebuilding through fostering intercultural dialogue". It might sound a bit unusual, but it is very relevant for our society at the moment and it provides a great opportunity for you to see how our work in ESN connects to it. Therefore, some of the workshops will focus on developing skills on our volunteers that can be used to promote a more peaceful Europe through intercultural learning. For futher information visit ESN Eduk8's facebook page or website.